Without all your teeth, chewing and eating can destabilize your bite and cause you discomfort or even make you look older. If you have missing teeth, it is crucial to let Dr. Keryluk know so he can work with you as soon as possible to help you smile again! A dental implant is made of metal and porcelain that looks just like your natural tooth! It's composed of two main parts: the titanium implant body that takes the place of the missing root, and the tooth-colored crown cemented on top of the implant. Under the care of everyone at Keryluk Laser Dental in Port Coquitlam, you can smile confidently knowing no one will ever know you have a replacement tooth. 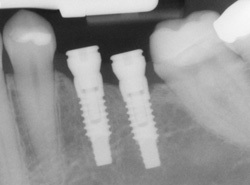 Dental implants can even be used to anchor dentures and bridges! How will my experience be at Keryluk Laser Dental? You're in good hands at Keryluk Laser Dental! Dr. Glenn Keryluk has performed more than 75 successful dental implant treatments (and counting!) with zero failures so far. Since we take a CT scan of your jaw, he will plan all of your treatment using 3D computer technology. The main aspect of treatment at our dental office that differs from 95% of other dentists in British Columbia is that we use the latest laser dental technology to place an implant, rather than cutting into your gum tissue. Using this approach, there is very little bleeding or pain, and will help you to recover much quicker than dental implant treatment elsewhere! All in all, you'll have four short appointments and one appointment that will last a little longer. The longest appointment normally lasts about two hours, but that depends on the number of dental implants you need. The best part? Your first consultation is always complimentary! To schedule your consultation, call Keryluk Laser Dental at (604) 941-0299!